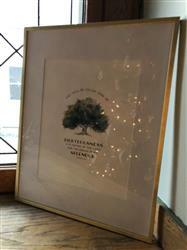 This print is one of four artworks in a series titled “Trees of Faith”. This illustration features the oak tree of righteousness from Isaiah 61:3, a great reminder that we are His people planted like a mighty tree for the display of His splendor. I absolutely adore the Oaks of righteousness print! God’s Fingerprints provides stunning artwork and beautiful quality products you’ll want to display in your home!